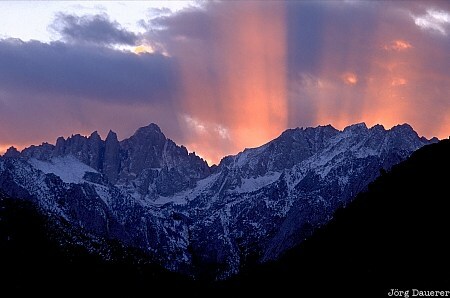 The sun setting behind Mount Whitney creates spectacular light beams as seen from the Alabama Hills. The Alabama Hills are in the Owens Valley in eastern California, United States. This photo was taken in the evening of a rainy day in October of 2002. This photo is part of the exhibition Sun Beams (October 2011). This photo was the image of the month in April of 2014.